The smooth, cinnamon and gray patchy bark of this lovely Crape myrtle (Lagerstroemia indica) makes many a gardener swoon. 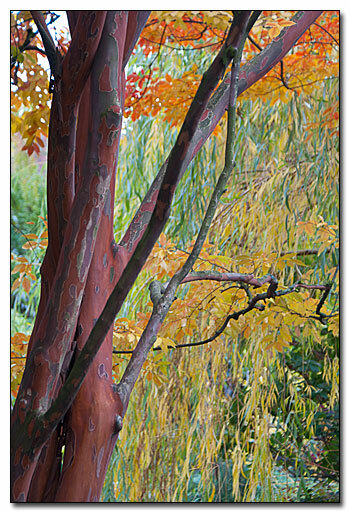 It is at this time of year that crape myrtles really shine with fiery orange and crimson foliage, in concert with unique patterns of mahogany, charcoal, and chocolate in the bark. Of course, the fresh, green leaves of spring and the crinkly, white petals are nothing to sneeze at either! I believe this is Lagerstroemia indica ‘Natchez’, taken at Lan Su Chinese Garden in Portland, Oregon. Crape myrtles come in heights ranging from 18 inches to 40 feet. They prefer moist, well-drained soil and full sun, something that can be hard to come by in the Pacific Northwest. I took this photograph on a cold, wet November morning. The golden leaves of a nearby willow makes one imagine sitting by Monet’s pond on a warm, autumn afternoon.